Well, having just posted yesterday about some of the rain storms we have had lately I felt compelled to snag a photo of the rain we had yesterday. 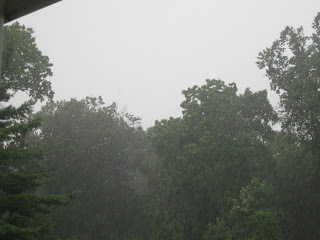 I got caught in this while out jogging, about 5 minutes from home, I tried to stay under the trees until I got home. Needless to say the flowers will not need a drink for a while. This gives me the idea that CoolStuffForDads.com needs to offer a few umbrella gift options for men.